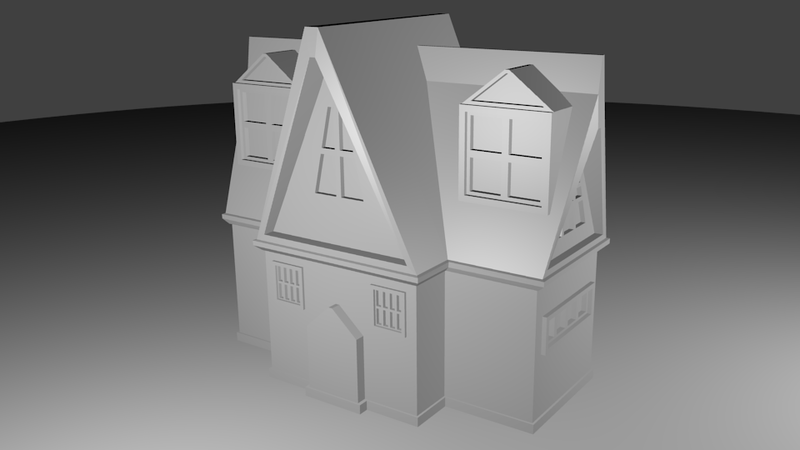 A simple house I made while learning to use Blender, such an awesome piece of software, fell free to use it however you want, also let me know what you think it's my first 3D model :) . Sorry for not texturing it I'm stil learning that part with Blender. Better than what I did for my first try. A lot of people make the mistake to try to build something nice instead of building something functional for game art. Duion: Not every model is for low poly 3D games. That said, it would be nice to see this textured. Alucard: there is a setting in scene that allows you to use metric units instead of nameless ones. That will help alot. But why high poly if the same can be build with far less polys without any real visual drawback, another advantage of low poly would be the easier texturing. 3.8k is not much for an house, I dont know your standards but a scene can have 100k triangles easily (probably several millions on a modern gpu). Faking windows and ledges definitely have visual drawback. I havent checked file in detail bu it doesnt look bad in wireframe. I would have solidified walls if aiming for a 3D game though. With another look, side windows could be optimized. Actually I did some optimization and reduced it to 2.8k. delete -> edge loop helps a lot. Also, your front door needs some improvement. Thanks for the feedback guys, I'll definitely improve it more and since it's ment to be used in Unity 3D poligons will be reduced as much as possible. Also if you have links to some useful tutorials for beginners please share them with me. Thank you. Yes 3.8 k polys is not much, but this is just the facade of the house, there is no interior modeled and no decoration on it. And the house is just one item, you will likely have hundrets of other items in the scene and this all adds up. Duion: Big difference between "constructive criticism" and just "criticism" I think this model is well done and it is not necessarily for games. It is FREE, remember?